Any company in Tourism industry across the globe is eligible to nominate for International Travel Awards by KSA. All nominations are self-nominate basis. Simply register online at https://internationaltravelawards.org/award-nomination/ and our consultants will guide you from there. At International Travel Awards by KSA, Each company competes in Country, Continent & World Level. Unlike any other program, We encourage our nominees to choose more country level options which help them to increase their winning chances. Country level winners will be announced online during the month of Jan & Feb 2019. Country level winners will receive Winners Certificate (by Email / Online ). Country level winners can order a Winner Trophy at additional cost and same can be collected from the Gala Ceremony. Incase if country level winner would like to receive it by shipping then international shipping charges applicable and payable in advance before the shipment. Regional / Continent & Global Level winner receives Trophy & Winner Certificate at the Grand Gala Ceremony. If the winner would like to receive it by shipping then international shipping charges applicable and payable in advance before the shipment.. Regional & Global Level Finalist & Winners are allowed to attend the Gala Ceremony at FREE of cost. One one person is allowed to attend on complimentary basis. Customer reviews posted in various online forums, Social Media, Booking websites such as booking.com, agoda.com, Hotels.com, expedia.com & etc. Partner or Vendor feedback / Reviews & etc. Every nominee should reach minimum threshold voting for each category, Incase if the minimum voting is not reached then the category will not be considered for the final stage. Only the categories reach minimum threshold voting enter into the final stage. Reviews on nominee company website will not be considered. only 3rd party website reviews will be accountable. Nominee gets free points from the organiser if they submit any online Press Release mentioning the awards website URL, Logo & etc. Maximum of 3 PR Submissions will be considered and from 4th PR will not be accountable for judging criteria. Voting will be reviewed by our internal to avoid any kind of bots or software automations. The company will be disqualified immediately if they use any software automation or bots to increase the votings. IP address of every voter will be recorded and incase of multiple votes from the same IP address will not be considered. Only 1 vote count will be considered. Size of the company will not be accountable for the judging criteria. Our jury team reserves the rights to set the minimum threshold voting for each award category & nominee company as per our company's internal judging policy and this details will be confidential within the jury team. Every type of company has its own minimum threshold voting points such as Hotels, Travel Agents, National Tourism Board, Cruise Companies, Airlines, Car Rental companies, State tourism board, Theme Parks & etc. Incase of more voting from the nominee company then only 2 votes will be counted as valid votes and other votes from the same companies will not be considered. Sponsors get lot of marketing benefits along with Voting points from the organiser which helps the sponsors to maximise their winning chances. Only 1 Trophy & certificate will be provided per company by the organiser. Additional trophies can be ordered at additional charges. 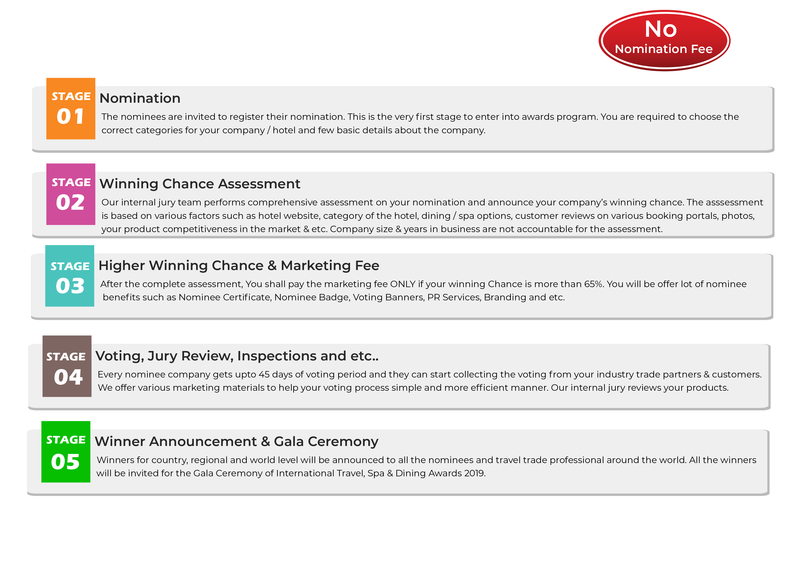 Nominating for multiple categories increase the chances of winning the award. But only 1 winning category per company is applicable. No refund is applicable incase of multiple category nominations. The Organiser reserves the rights to increase the winning category to maximum of 2 based on our management approval and this is applicable exclusively for sponsors. Contribution towards Corporate Social Responsibility (CSR), Environment Friendly activities by the nominee company & etc.., will be beneficial for nominee to increase the winning chance. The Organiser or Jury team reserves the rights to qualify or disqualify any company without prior notice. The organiser reserves the rights to modify the judging criteria without prior notice to improve our quality of judging process. We recommend each nominee to review our judging process frequently.